YouTube Music is missing some essential features, but it has a decent foundation. A massive number of people use YouTube not just for videos, but as a de facto music-streaming service, not unlike Spotify. YouTube is well aware of this, which is why the company has been trying to make music an official part of its paid offerings for nearly four years now. This week, YouTube Music launched in early access, and it's the closest the company has come yet to building a proper Spotify or Apple Music competitor. Google's launch strategy behind YouTube Music and what's now called YouTube Premium has been confusing, but now that the service is rolling out to the masses, it's time to see how it stacks up to other streaming-music options. After spending a few days with YouTube Music, it's clear that there's potential here, but that a ton of work needs to be done before it's on par with the established players. If you've ever used Google Play Music (a full-featured streaming service that Google has offered since 2013), YouTube Music should feel pretty familiar. Whether you're streaming from the web or your phone, the experience begins on the Home screen, where you'll find a wide variety of playlists, albums and videos to get music flowing with just one tap. In many cases they're identical to the playlists and stations that Google Play Music has offered for years. The Home screen groups them by categories like "energy boosters," "throwback jams" and "mellow moods." You'll also find sections for your most recently-played tunes, a selection of new releases based on your listening history, recommendations for artists and playlists that are similar to others you've been listening to, and, of course, music videos. In fact, videos are peppered throughout YouTube Music, but it's important to note that this is primarily an audio-focused experience, in a way that other YouTube offerings haven't been. That feed of playlists, videos, artists and albums is easily the best part of YouTube Music. While I get the feeling some categories will always be there regardless of your listening habits (e.g., "Today's Biggest Hits," which has playlists for the big mainstream genres), the rest of the experience is tailored to your taste. When you sign up, YouTube Music asks you to pick some of your favorite artists from a long scroll; it's fun to swipe through it and find the bands and singers you love the most, and it helps the service make better recommendations. For most people, a scroll through the Home screen will get you up and running quickly. Beyond the homepage are just a few other tabs: Hotlist and Library. As you might gather, Hotlist focuses on trending and popular music videos. There were 20 videos in the Hotlist at launch, and the vast majority of them were for hip-hop and pop artists. If you're not a fan of those genres, chances are good that you won't look at the Hotlist very often -- but those who want to stay on top of the biggest trends in music will likely find something of interest, as long as YouTube updates the Hotlist on a regular basis. The Library is more useful -- but it's also one place where YouTube Music feels unfinished. Here, you'll find everything you save, including songs, albums and playlists. Unfortunately for anyone looking to build an extensive music collection, the library gets unruly fast. When looking at your saved albums, for example, there's no way to sort alphabetically or by artist; you can view them only by most recently added. I added a few dozen albums right off the bat, and sifting through them here was not fun -- I shudder to think what it'll be like when I have hundreds of albums saved. Similarly, the way the library handles artists feels unintuitive. Most services have an artists section that populates based on what songs, playlists and albums you've saved. On YouTube Music, however, only artists whose channel you've subscribed to show up. I could save every album in Pink Floyd's discography to my library, but they wouldn't show up under the artists tab of my library. At least the artists list is in alphabetical order. Maybe my view of having a "music library" is skewed by having grown up owning dozens of CDs, followed by a carefully-crafted iTunes library. 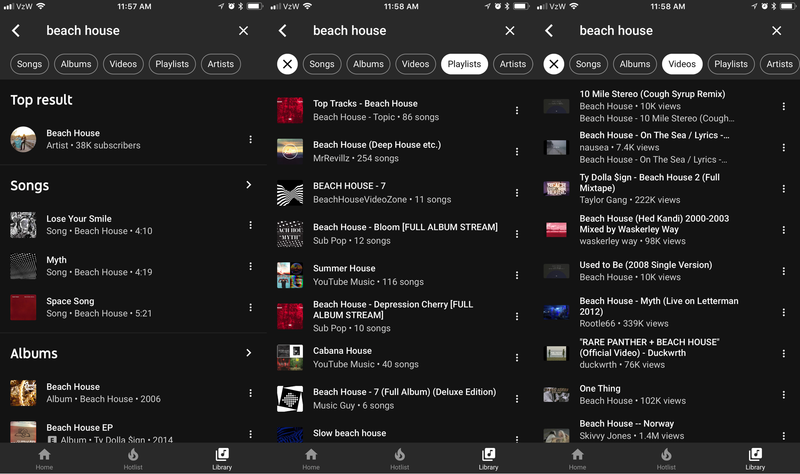 Maybe search is all most people really need -- and in a lot of ways, it seems to be the best way to get around YouTube Music. Typing in the search box brings up artists, songs, playlists, albums and videos related to your term. This is another highlight because it's where also where YouTube's deep catalog comes to the forefront. Any video out there related to your search will pop up, something that no other music service can come close to matching. Whether you're looking for live versions of songs, instructional guitar videos, 90-minute DJ mixes or something else entirely, chances are good you'll find it on YouTube. On the mobile app, you can download any video you want for offline playback, regardless of whether it's an official music video or fan-shot concert footage. Fortunately, if you're primarily interested in original recordings, those always show up first in search results. When the old YouTube Music app launched back in 2015, being able to access this vast trove of music was the best thing about it. Combining that with a full-fledged streaming service means you don't have to keep jumping between apps, so that's a big win for the new YouTube Music. The old app also let you search for audio-only songs and albums if you had a Google Play Music or YouTube Red subscription, but the app itself was clearly optimized for video. That's not the case anymore, which makes it easier to live your entire streaming life inside YouTube Music. Unfortunately, YouTube Music has many quirks that could be deal-breakers for some users, so don't go canceling Spotify just yet. As I mentioned earlier, YouTube Music, like Google Play Music before it, has a great collection of curated playlists that span genres, decades, moods and activities. In fact, Play Music let you use those four categories to browse all those playlists. In YouTube Music, you can access these playlists only through your homepage. If you're looking for a new workout mix or want to find the best '90s playlists out there, you'd better hope YouTube's algorithms put them on your homepage. It's a bummer because I particularly enjoyed digging into the many different classifications in Google Play Music. Of course, you can search "workout" and then check out all the playlists that surface, but it's not nearly as elegant a solution. Similarly, YouTube Music doesn't make it easy to find new releases. There's a "recommended new releases" section on the homepage, but there are only 10 albums in it. There's no way to simply see new albums from the week, something basically every music service offers. 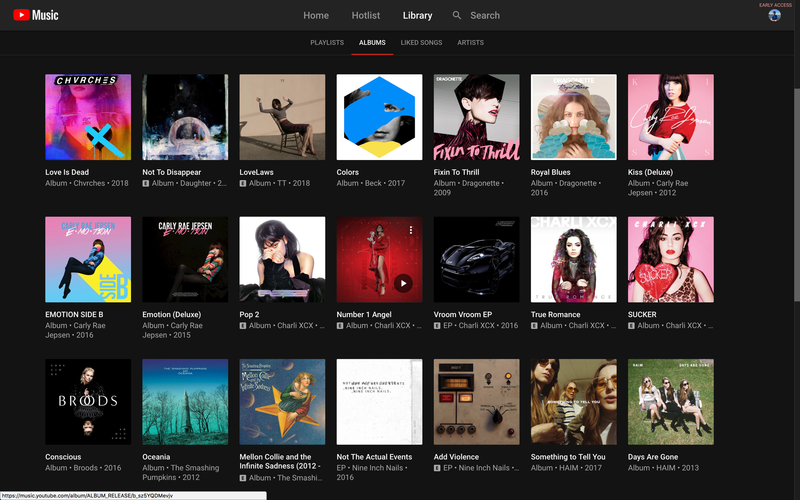 Play Music lets you see all new releases or sort by genre, and it also offers a constantly-updating New Release Radio station personalized to each user. That's all absent here. There is an "offline mixtape" customized to each user that can be automatically downloaded to your phone, but it's mostly just a selection of things you've already listened to and liked. YouTube Music doesn't even offer you a way to click through to specific genres. 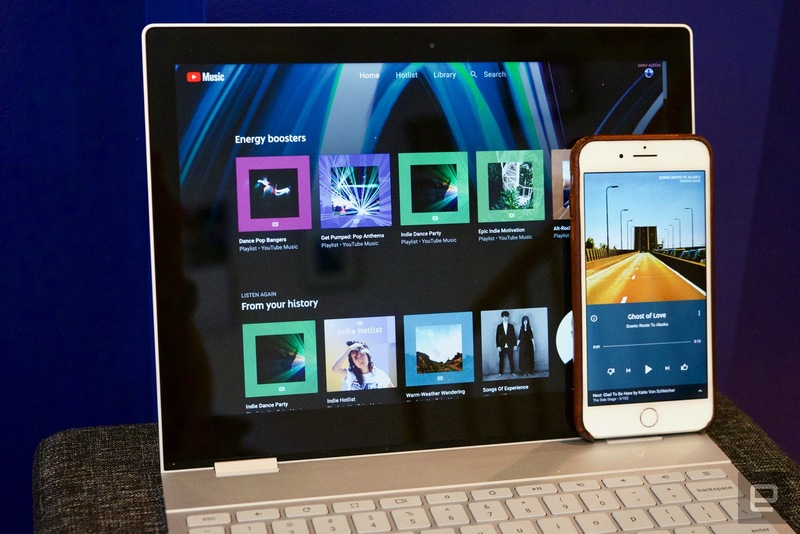 Apple Music and Spotify both feature robust genre pages that pull together new releases, classic albums, videos and a wide range of playlists. There's nothing comparable here -- yet another thing that makes the service feel incomplete. Finally, using YouTube Music can add some annoyances to the standard YouTube experience. Remember all those artists you subscribed to so that they'd show up in your library? Well, they'll all show up as subscriptions over on the video-focused YouTube as well. Perhaps worse is how every album you've added to your library shows up as a playlist in the standard YouTube library -- having dozens of albums obscuring the actual video playlists you've created or subscribed to is a definitively bad user experience. I'm hoping that Google works out these growing pains and that YouTube's feature set matches that of Play Music before long -- not to mention coming closer to what Spotify and Apple are offering. My favorite feature of Play Music is the huge variety of playlists and the many ways you can browse them to find songs to fit your mood, and I'm very glad those playlists are present in YouTube Music. Assuming Google improves the browsing and library features and adds Play Music's "locker" feature, YouTube Music will absolutely be worth your $10 per month. Until then, though, it's a little hard to recommend unless you love music videos. The good news is that Google has said it'll be adding these missing features pretty quickly -- that makes sense, given that the company is reportedly planning a massive ad campaign around YouTube Music.